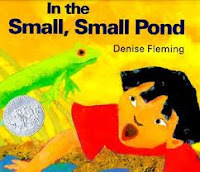 Story Time With the Library Lady: Story Time Theme: "Down At the Pond"
Story Time Theme: "Down At the Pond"
I am catching up on programs I did in July, and this was one of my favorites, focusing on pond animals. Since we had done In the Tall,Tall Grass several weeks before, doing this book was a natural follow-up, particularly since I have this one in a big book as well. In that one, the children get to watch the caterpillar change size in proportion to the other animals on the page. In this one, that role is taken by the frog. 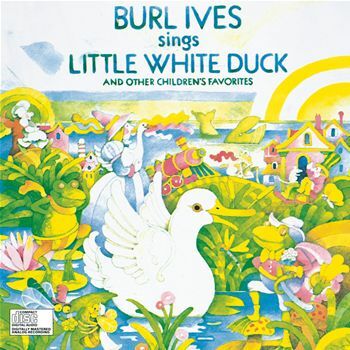 I grew up with this album, so I was doing "The Little White Duck" as a song/magnet board long before the lovely colorful picture book version came out. Now at regular programs I usually use the book while singing the song. But for a large group I had visor hats for the characters instead. 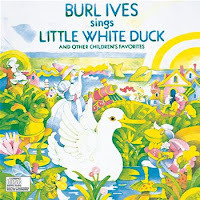 I also used the duck hats to do the song "Five Little Ducks"
Somewhere or another I saw a rhyme called "All the Fish Are Swimming In the Water"After doing a search, I found a song version of it from a lady named Sue Schnitzer and I've been using my version of it with the "Mother Goose" set. It worked just as well with the (slightly) older kids at this program. 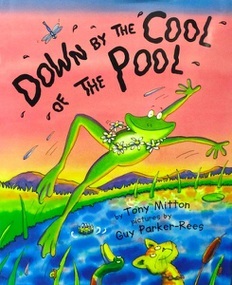 I had verses for fish, frogs, ducks, gators, geese and kids! You can hear a clip of it and download it HERE --I probably need to buy her CDs for our collection. I love Tony Mitton's work--his "Dinosaurumpus" and "Playful Little Penguins" are story time standards for me. I had never done this at a story time, but it was a natural to act out with the kids. Because there are so many characters, I didn't have all the foam visors/masks that I needed for all of the characters. I could have used puppets, but that can get awkward with young children who really can't hold puppets properly. And I wanted to have the kids participate. So I made a bunch of new foam visors. And that will be coming up in my next post. Meanwhile, I will leave you with a great version of "Three Little Fishies" from "The Muppet Show". I grew up singing this with my family, and had lots of fun bringing out fish visors for 3 little fish from my audience!